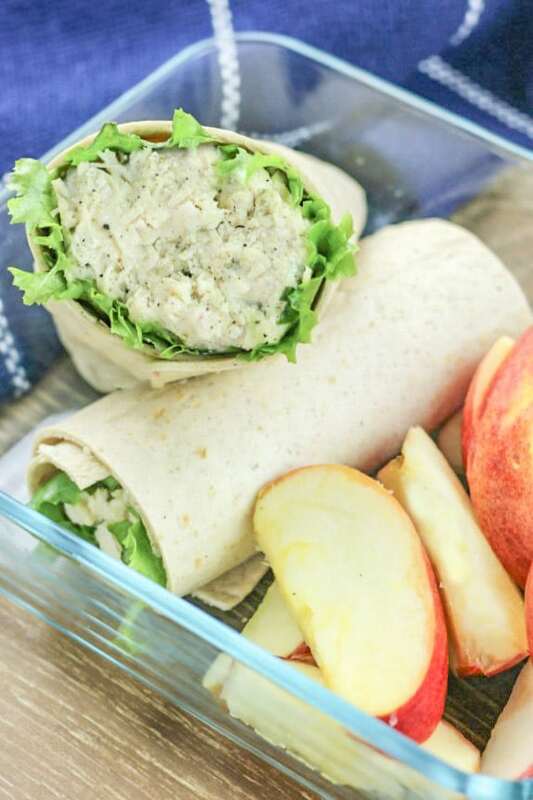 These Instant Pot Caesar Chicken Wraps are a perfect light dinner or for prepping lunches for the week. I’m having a bit of a love affair with the Instant Pot. At first thought all the talk my I was seeing on Facebook was a bunch of hype about the latest kitchen gadget. But, the more people talked about them the more I wanted one. 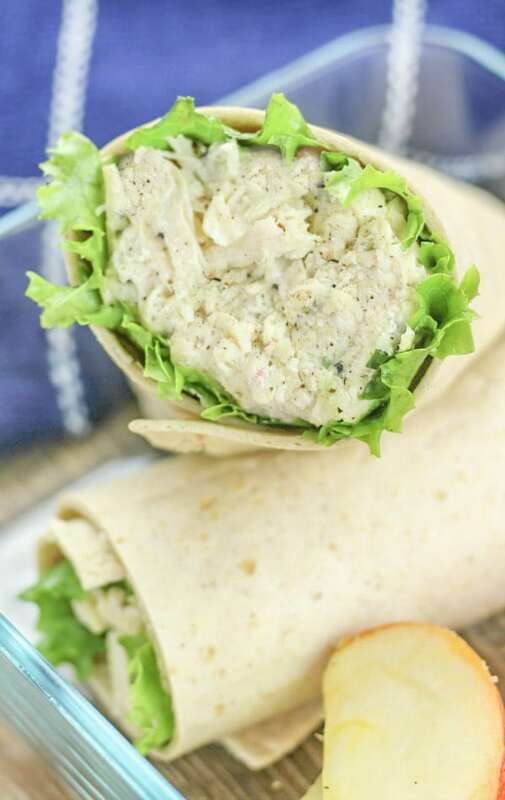 Now that I have one I’ve got to admit I’m hooked and it makes recipes like these Instant Pot Caesar Chicken Wraps super easy! In January I went to a business conference in Atlanta with my husband. I helped out with his business’ both by keeping things organized and making conversation with customers and friends. One day at lunch we grabbed a couple wraps from one of the vendors in the World Congress Center. I have a Caesar Chicken wrap and that inspired this recipe. This recipe made enough chicken salad for a week of wraps. I prepped everything on a Sunday afternoon. Put mixture in a tightly sealed container and then lunch was ready for the week! How Do I Cook Chicken In The Instant Pot? Place the chicken breasts in the bottom of the Instant Pot’s bowl. Then pour a cup of chicken broth or stock over the top. Place the lid on and lock it in place. Seal the release valve and then set the pot on high pressure for 10 minutes. At the end of the cooking time release the steam then using pot holder remove the bowl. Drain and discard the liquid from the bowl. Can I Cook Frozen Chicken Breasts In The Instant Pot? Yes! This is probably one of my favorite things about pressure cooking you can cook chicken without thawing it first. To do simply follow the same steps as cooking thawed chicken breasts with the exception of increasing the cooking time from 10 minutes to 20 minutes. Easy peasy! Plus, it’s a great time saver!! Do I Have To Use Liquid When Cooking In the Instant Pot? It is important to use liquid such as broth, stock or water when cooking in the Instant Pot or any pressure cooker. Pressure cookers cook quickly since they use pressure created from the hot, built-up steam trapped in inside the pot. Never use less than two cups of liquid when cooking in your pressure cooker. As I said way back at the beginning of the post these Instant Pot Chicken Caesar Wraps are super easy to make. Begin by placing chicken in the bowl of the pressure cooker. Next, pour a cup of chicken broth over the top of the chicken. Place the lid on the Instant Pot and lock into place. Check to make sure the vent is sealed and then set the pot on high pressure for ten minutes. At the end of the cooking time, release the steam then using pot holders remove the bowl from the cooker. Pour off any remaining liquid and discard. Remove the chicken to a cutting board or plate and shred using two forks. Return the chicken to the bowl and place back into the pressure cooker. Turn on the sauté function and then add Caesar dressing, garlic powder, onion powder and chopped parsley to chicken. Stir it together and then warm through. Turn off pot and allow the mixture to cool. Spoon desired amount on to tortilla. Fold bottom of tortilla to create a pocket and then roll it crossways. If you are not eating right way the chicken mixture will keep up to seven days in a tightly sealed container in your refrigerator. Begin by placing chicken in the bowl of the pressure cooker. Next, pour a cup of chicken broth over the top of the chicken. Place the lid on the Instant Pot and lock into place. Check to make sure the vent is sealed and then set the pot on high pressure for ten minutes. At the end of the cooking time, release the steam then using pot holders remove the bowl from the cooker. Pour off any remaining liquid and discard. Remove the chicken to a cutting board or plate and shred using two forks. Return the chicken to the bowl and place back into the pressure cooker. Turn on the sauté function and then add Caesar dressing, garlic powder, onion powder and chopped parsley to chicken. Stir it together and then warm through. This is fantastic! My kids are not big into lunchmeat so they struggle with what to pack for school lunches! 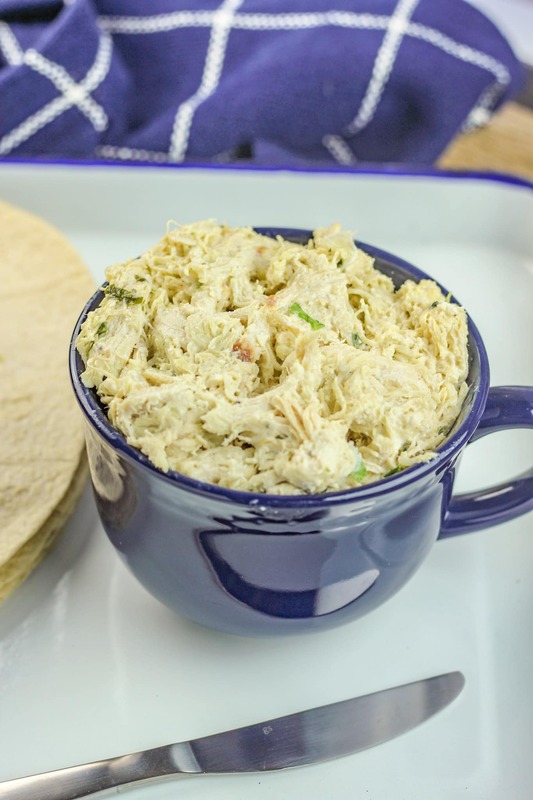 They adore chicken salad and this is the perfect way for me to make a large batch of it! Thank you!! This is one seriously yummy chicken wraps recipe! That it was made in the Instant Pot increased my love for it even more. I’m planning on making this delicious recipe again in a few weeks to serve at my friend’s baby shower. Yum! This was a great meal idea for the whole family!